On a warm day early in spring, many will head to the garden center. We are ready to dig in the dirt again. While waiting for the weather to warm up to plant tender perennials and annuals, you can still get your gardening fix by planning your garden beds, including container gardens. Container gardens can be enjoyed in a range of spaces – a balcony, porch, deck, pool, window box, and even in the perennial borders; a raised container can add rhythm and height to your garden beds. Just about anything can become a container – from apple crates to zapatos. So next time you wear out a beloved pair of gardening shoes, use them as containers and pot ‘em up. In many ways, the type of container you use and the way you use it, is guided by the style of your garden and the look you’re trying to achieve. A simple clapboard house with two large urns filled with cottage garden plantings flanking the front entrance can be enough to evoke all the charm of a full fledge cottage garden. For a modern home, a sculptural shaped glazed pot planted with a stunning plant, offering architectural interest, may be all the space needs. Adding any more to a modern space may spoil the moment. A traditional-style home can’t go wrong with a pair of containers setting a symmetric stage greeting visitors or even a large single pot for an asymmetric punctuation point. Every home and garden style can benefit from a container garden to complement its own personal style. When choosing plants for your container garden, include plants with similar cultural conditions such as light and watering needs. Also consider each plant’s growth rate. Ideally, the growth rate during the season should be similar so one plant doesn’t dominate the container later in the year. Depending on the overall look of the container garden and the style of home it will complement, arrange either a single plant specimen, a pairing of plants such as a mop top topiary with an under planting, or a filler, thriller, spiller effect – filler to add fullness, a thriller to add a wow factor, and a spiller to soften the side of the container with a trailing plant. 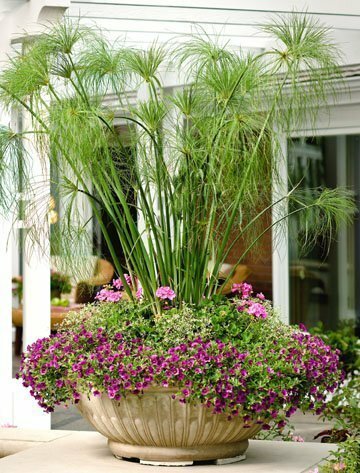 When choosing a container, choose the largest pot within your budget that also fits the space and overall design aesthetics. Containers need to be watered frequently. The larger the pot, the less frequent watering will be needed. During the heat of the summer, containers may need watering once a day. If too small, watering twice a day is not uncommon. Because of the contained space, nutrients leach out with each watering. It’s important to fill container gardens with a quality potting mix and also blending in a slow-release fertilizer to replenish nutrients during the season. Topdress your container with mulch; not only will it decorate the pot, but it will reduce splashing and retain moisture. Mulch choices can be more than serving a purpose; they can be an extension of your personality. Be creative. Simple wood and bark mulches work fine, but consider shells, pebbles, or any material you might have available, such as acorns or even marbles. It just depends on the look you are trying to achieve. With the planting complete, consider adding an accent to finish the design. Unleash your creativity and get your gardening fix by planting a garden in a container. Helen Yoest, owner of Gardening With Confidence™, is a wildlife gardener, garden coach and garden writer in Raleigh. Catch up with Helen via her blogs at www.GardeningWithConfidence.com/blog, and www.TarHeelGardening.com/wordpress.